Portrait by Lucia Moholy. Dressed in workman's overalls, at entrance to his "Master's House" at Bauhaus in Dessau, 1926. Moholy-Nagy in his studio, c1923. 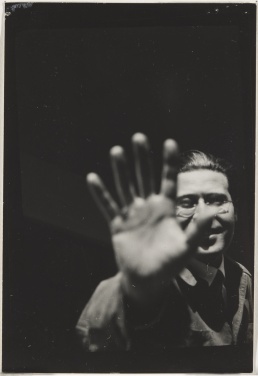 Lucia Moholy, Untitled (Portrait of László Moholy-Nagy), 1925. Gelatin silver print. 9.3 x 6.3 cm. MoMA. 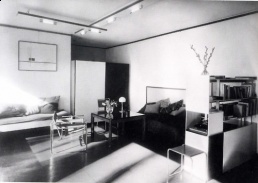 Living room of László and Lucia Moholy's Master House, Dessau, c1926. Photo: Lucia Moholy. 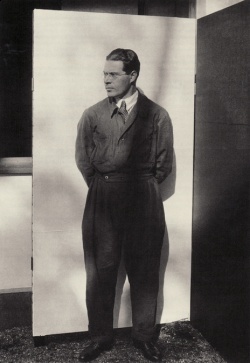 László Moholy-Nagy (1895-1946) was a Hungarian artist, filmmaker and designer. He worked as Professor in the Bauhaus school and later founded the New Bauhaus in Chicago. He was highly influenced by Constructivism and advocating the integration of technology and industry into the arts. 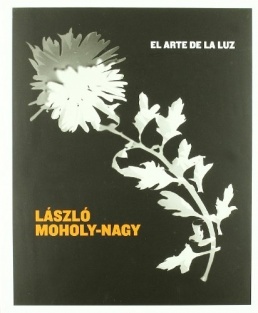 Moholy-Nagy was born László Weisz in Bácsborsód to a Jewish-Hungarian family, his father was a wheat farmer. His cousin was the conductor Sir Georg Solti. He changed his German-Jewish surname to the Magyar surname of his mother's Christian lawyer friend Nagy, who supported the family and helped raise Moholy-Nagy and his brothers when their Jewish father, Lipót Weisz left the family. Later, he added "Moholy" to his surname, after the name of the town Mohol in which he grew up. One part of his boyhood was spent in the Ada town, near Mohol in family house. In 1918 he formally converted to the Hungarian Reformed Church (Calvinist); his Godfather was his Roman Catholic university friend, the art critic Ivan Hevesy. He attended Gymnasium (academic high school) in Szeged. His interest had been primarily literary. He had published poetry and short stories since the age of 13 in progressive little magazines. In 1914 he enrolled at University of Budapest to study law; in Budapest he became a friend of the poet Ady and through his friends became acquainted with progressive young writers and musicians. In August 1914 he was called into the Austro-Hungarian army; in October 1914 sent to the Russian theater; in 1915 while recovering from shell shock in a field hospital he started to do pencil and crayon sketches. In 1917 he received a severe wound, which mutilated his left thumb; during his convalescence, first at Odessa and later in Szeged, he began to paint portraits using water colours and oil pencil. After becoming involved with the journal Jelenkor [The Present Age], edited by Hevesy, he organized the "Activist" group called Ma [Today] with four friends including Lajos Kassák. After his discharge from the army in October 1918, he returned to Budapest and took a degree of Bachelor of Laws at the University. He did not, however, intend to practice law; he had continued painting, and attended the private art school of the Hungarian Fauve artist Róbert Berény. 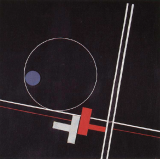 In 1919 he began to acquaint himself with the work of other modern artists, especially with Malevich and Lissitzky; in Budapest there were no recent paintings, only a few reproductions of paintings by western artists to be seen, since the city had been completely isolated from the west during the five war years. MA group began to publish a contemporary art quarterly. He was a supporter of the Communist Dictatorship (known as "Red Terror" and also "Hungarian Soviet Republic"), declared early in 1919, though he assumed no official role in it. After the defeat of the Communist Regime in August, he withdrew to Szeged. An exhibition of his work was held there. Around November 1919 he left for Vienna where he felt he would have greater stimulus and closer association with men of his own artistic vision. Up to this time his paintings and drawings had been representational in the cubist manner: representational forms were still recognizable, though reduced to formalized or merely linear elements. In February 1920 he left for Berlin. After his arrival he did purely non-objective work, devoting almost a year exclusively to collages and photograms ("cameraless photographs"). He had contact with Dadaists. In 1921 he became acquainted with the Russian constructivism. In the winter 1920-21, Hervard Walden arranged the first exhibition of Moholy-Nagy's work in Der Sturm gallery in Berlin, where he shown his first photograms and Telephone Pictures, with Laszlo Peri, that later travelled to Hanover, Dresden, Halle, Stuttgart, Hamburg and Frankfurt. He finished the film-script for Die Dynamik der Grossstadt. In Vienna he edited, together with Lajos Kassák, the Buch Neuer Kuenstler, an anthology of modern art and poetry. In 1922 Gropius, founder of the Staatliche Bauhaus in Weimar saw Moholy's work and appointed him a professor. In the Spring 1923, Moholy-Nagy replaced Johannes Itten as head of the metal workshop at the Weimar Bauhaus. This period marked the end of the school's expressionistic leanings and moved it closer towards its original aims as a school of design and industrial integration. His interest in industrial design and architectural exhibitions dates from that time. Like the other teachers at the Bauhaus he worked not only in a workroom assigned to him but collaborated with Oskar Schlemmer and others on murals, ballet and stage designs, in light and colour experiments, and in typography and layout. With Gropius he planned, edited and designed the fourteen Bauhaus Buecher, each volume presenting a particular phase of Bauhaus work. His own books in this series--Malerei, Fotografie, Film (1925) and Von Material zur Architektur (1929) stated his own visual and pedagogical creed and gave examples of his experimental work in light and colour. His teaching had a profound influence on a number of his students, including Marianne Brandt. By 1923 he described his paintings as Constructivism, and his earlier linear emphasis turned to an emphasis on coloured forms. But between 1923 and 1927 his interests were centered chiefly on photography, which offered him an unlimited field for experimentation. In 1924 he began creating photo-sculptures. In 1927 he met Malevich. From 1927-1929 he was a photography editor of the Dutch avant-garde monthly International Revue i 10. Emerging nazism of German politics tried to impose on Gropius so many restrictions and compromises in his management of the Bauhaus that he resigned in the early 1928. Moholy-Nagy, who was his closest collaborator, resigned with him and worked free-lance as a highly sought-after designer in Berlin. Oskar Schlemmer in Ascona, 1926 . Lucia, 1924-28. Gelatin silver print. 8.2 x 5.4 cm. From the Radio Tower, Berlin, 1928 (printed c1941). Gelatin silver print. 24.7 x 19 cm. In Berlin, Moholy-Nagy made a brilliant career for himself as a stage designer for the progressive State Opera and the Piscator Theatre. His Tales of Hoffman, Madame Butterfly and The Merchant of Berlin became the main attractions. He also designed three large exhibitions of new building methods and new design in Berlin, Brussels and Paris, and became prominent as a typographer and poster designer. His interest in static photography gradually declined and he began to experiment in films, photograms and sound film combinations. Marseille Vieux Port (1929) was his first film. His studio employed artists and designers such as Istvan Seboek, Gyorgy Kepes and Andor Weininger. Perhaps his most enduring achievement is the construction of the Lichtrequisit einer elektrischen Buehne [Light Prop for an Electric Stage] (completed 1930), a device with moving parts meant to have light projected through it in order to create mobile light reflections and shadows on nearby surfaces. Made with the help of the Hungarian architect Istvan Seboek for the German Werkbund exhibition held in Paris during the summer of 1930, it is often interpreted as a kinetic sculpture. After his death, it was dubbed the Light-Space Modulator and was seen as a pioneer achievement of kinetic sculpture. It might more accurately be seen as one of the earliest examples of Light Art. With it he also made his best known film, 'Lightplay, Black-White-Gray (1930). He began using new plastic materials as background for his paintings, mainly galalith and neolith, trolit and collon. Later he added the new transparent rhodoid and plexiglass. He also used aluminum and copper plates and created a series of enamel paintings. 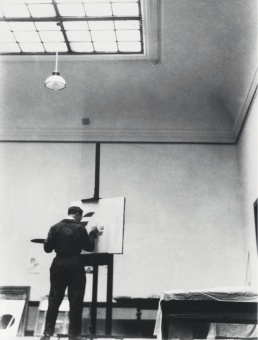 In 1930 The Solomon R. Guggenheim Foundation in New York started to buy his paintings. The Stockholm National Museum arranged an exhibition of his work; so did the museums in Amsterdam, Brno, Hamburg, Mannheim, Cologne and Budapest. His work in this period was concentrated upon new methods of advertising. Extensive trips to France, Finland, Norway, Switzerland, Italy, Greece, etc. stimulated his interest in new methods for producing documentary films (Marseille, Gypsies, Streetpicture, Finland, Architectural Congress), and new approaches to static photography. He organized the Stuttgart Werkbund exhibition Film und Foto. In 1931 he held a series of 6 lectures at the School of Arts and Crafts, Bratislava. After the Nazis came to power in Germany in 1933, and, as a foreign citizen, he was no longer allowed to work, and in December 1933 moved to Amsterdam, where a large printing company offered him facilities for experiments with colour film and photography. While there he held his solo exhibition in Stedelijk Museum, Amsterdam (Nov-Dec 1934), and designed the large Fair in Utrecht (March 1935) for Dutch Rayon Industry, the manufacturers of artificial silk, which offered a new approach to exhibition architecture and which, a year later, found its continuation in the Courtauld Exhibit at the Industrial Fair in London. After his travel to Paris in March 1933 he moved to London in May where he formed part of the circle of émigré artists and intellectuals who based themselves in Hampstead. Moholy-Nagy lived for a time in the Isokon building with Walter Gropius for eight months and then settled in Golders Green. Gropius and Moholy-Nagy planned to establish an English version of the Bauhaus but could not secure backing, and then Moholy-Nagy was turned down for a teaching job at the Royal College of Art. Moholy became art advisor for Simpson, the Royal Air Lines and the London Transport. He photographed contemporary architecture for the Architectural Review where the assistant editor was John Betjeman who commissioned Moholy-Nagy to make documentary photographs to illustrate his book An Oxford University Chest. He had another two large volumes of documentary photography published: Street Markets in London, Eton Portrait. Made a documentary film Life of the Lobster. A completely new interest now began to develop in his painting. The production of transparent materials had so improved that sheets, clear as water, were obtainable. He designed three-dimensional paintings which not only displayed colour and form on top and underneath the transparent sheets but included the play of shadow created on a white background, three inches or so behind the actual picture; he called these paintings Space Modulators. In 1936, he was commissioned by fellow Hungarian film producer Alexander Korda to design special effects for Things to Come by H. G. Wells. František Kalivoda in Brno, Czecho-Slovakia, published in that year a monograph Telehor in three languages on Moholy's work. Was made a honorary member of the Oxford and Cambridge Art Societies and of the Designer Institute of London. Working at Denham Studios, Moholy-Nagy created kinetic sculptures and abstract light effects, but they were rejected by the film's director. At the invitation of Leslie Martin, he gave a lecture to the architecture school of Hull University. In 1937, at the invitation of Walter Paepcke, the Chairman of the Container Corporation of America, Moholy-Nagy moved to Chicago to become the director of the New Bauhaus. Philosophy of the school was basically unchanged from that of the original, and its headquarters was the Prairie Avenue mansion that architect Richard Morris Hunt designed for department store magnate Marshall Field. Unfortunately, the school lost the financial backing of its supporters after only a single academic year, and it closed in 1938. 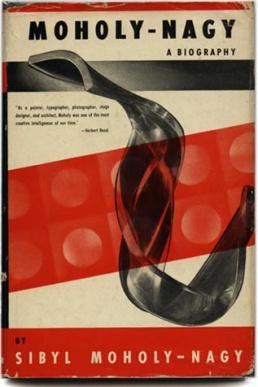 Paepcke, however, continued his own support, and in 1939, Moholy-Nagy opened the School of Design with most of his original staff (George Kepes, Robert J. Wolff, Charles Niedringhaus, James Prestini, etc). In 1944, this became the Institute of Design. In 1949 the Institute of Design became a part of Illinois Institute of Technology and became the first institution in the United States to offer a PhD in design. He authored an account of his efforts to develop the curriculum of the School of Design in his book Vision in Motion (1947). As a designer Moholy-Nagy was an art advisor for the mail-order house of Spiegl, Inc., for the Baltimore and Ohio R.R., the Parker Pen Company and others. To a reprint of his New Vision he added Abstract of an Artist and he published numerous articles on education, design, camouflage technique, rehabilitation of veterans, and painting. After 1940 Moholy-Nagy developed his three-dimensional Space Modulator toward richer light effects, through a heightening in his surface treatment and by the embodiment of free standing or suspended sculptures in the composition, to throw shadows or to multiply the reflections of natural or artificial light. In 1945 and 1946 he painted again a great deal; several larger oil canvasses and took particular interest in water colours and ink drawings, creating a variety of new approaches. Moholy-Nagy died of leukemia in Chicago in November 1946. At the time of his death he was President of the Institute of Design, now having 680 students in its own building on 632 N. Dearborn Street; a director of the American Designers Institute, of the CIAM (Congress Internationale Architecture) and a member of many progressive civic and art groups. Museums of New York, San Francisco, Chicago, Cincinnati, Detroit, Dayton, Jacksonville and Los Angeles have given exhibitions of his work and have purchased paintings. Moholy-Nagy University of Art and Design in Budapest is named in his honour. Works by him are currently on display at the National Gallery of Art in Washington, DC. In 1998, he received a Tribute Marker from the City of Chicago. In the autumn of 2003, the Moholy-Nagy Foundation, Inc. was established as a source of information about Moholy-Nagy's life and works. Bauhaus Archive, Berlin. Collection of papers and photographs. Cincinnati Modern Art Society Papers. University of Cincinnati. Catalogued collection of papers, correspondence and press clippings. Crane Collection. J. Paul Getty Museum. Santa Monica, California. Collection of photographs and photomontages. Hattula Moholy-Nagy Archives. Ann Arbor, Michigan. Uncatalogued collection of papers, correspondence, and press clippings of Laszlo and Sibyl Moholy-Nagy. Illinois Institute of Technology Archives. Chicago. Uncatalogued collection of papers, correspondence, and press clippings including the New Bauhaus Scrapbook. Institute of Design Archives. University of Illinois, Chicago. Catalogued collection of papers, correspondence, and press clippings. Files 79-86 on Moholy-Nagy. Berliner Stilleben [Berlin Still Life] (1926), Marseille Vieux Port (1929), Lichtspiel, Schwarz-Weiss-Grau [Light-Play Black-White-Gray] (1930), Talking ABC (1932), Gypsies (1932), Lobsters (1935), special effects for Things to Come (1936), The New Architecture of the London Zoo (1936). 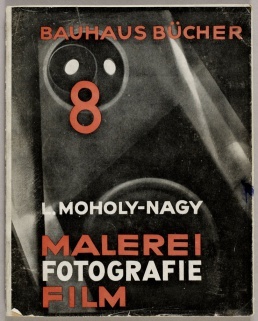 Moholy-Nagy, Painting Photography Film, 1925/69, Log. 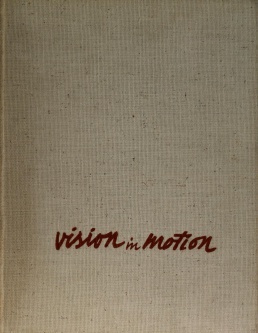 Vision in Motion, 1947, Log. Sibyl Moholy-Nagy, Moholy-Nagy - Experiment in Totality, 1950, Log. 60 Fotos, Photography and Photomontages by László Moholy-Nagy, Errata Editions, 2011, 92 pp. With essays by Franz Roh, David Evans, Jeffrey Ladd. (English) Review. Mary Benedetta, The Street Markets of London, London: John Miles, 1936, 201 pp. With photographs by Moholy-Nagy. Bernard Fergusson, Eton Portrait, London: John Miles, 1937. With photographs by Moholy-Nagy. John Betjeman, Oxford University Chest, London: John Miles, 1938. With photographs by Moholy-Nagy and illustrations by Osbert Lancaster and Edward Bradley. with Raoul Hausmann, Ivan Puni, Hans Arp, "Aufruf zur elementaren Kunst", De Stijl 4 (October 1921), p 156. "Manifesto of Elemental Art", in Moholy-Nagy, ed. Krisztina Passuth, New York: Thames and Hudson, 1985. "Production-Reproduction", in Moholy-Nagy, ed. Andreas Haus. New York: Pantheon, 1978. "Production-Reproduction", in Moholy-Nagy, ed. Krisztina Passuth, New York: Thames and Hudson, 1985, pp 289-290. "On the Problem of New Content and New Form", in Moholy-Nagy, ed. Krisztina Passuth, New York: Thames and Hudson, 1985. "Light-A Medium of Plastic Expression", Broom 4:4 (March 1923), pp 283-284 . Repr. in Moholy-Nagy, ed. Krisztina Passuth, New York: Thames and Hudson, 1985. "New Forms in Music. Potentialities of the Phonograph", in Moholy-Nagy, ed. Krisztina Passuth, New York: Thames and Hudson, 1985, pp 291-292. "The New Typography", trans. Sibyl Moholy-Nagy, in Moholy-Nagy, ed. Richard Kostelanetz, New York: Praeger, 1970. "Manifesto", in Moholy-Nagy, ed. Krisztina Passuth, New York: Thames and Hudson, 1985. "The Bauhaus in Dessau", in Moholy-Nagy, ed. Krisztina Passuth, New York: Thames and Hudson, 1985. "Theater, Circus, Variety", in The Theater of the Bauhaus, trans. Arthur S. Wensinger, Middletown, Conn.: Wesleyan University Press, 1961, pp 49-70. "Bauhaus and Typography", trans. Wolfgang Tabs and Basil Gilbert, in Moholy-Nagy, ed. Richard Kostelanetz, New York: Praeger, 1970. "Isms or Art", trans. Sibyl Moholy-Nagy, in Moholy-Nagy, ed. Richard Kostelanetz, New York: Praeger, 1970. "Directness of the Mind; Detours of Technology", trans. Sibyl Moholy-Nagy, in Moholy-Nagy, ed. Richard Kostelanetz, New York: Praeger, 1970. "Contemporary Typography - Aims, Practice, Criticism", trans. Wolfgang Tabs and Basil Gilbert, in Moholy-Nagy, ed. Krisztina Passuth. New York: Thames and Hudson, 1985. "Total Theatre is the Theatre of the Future", in Moholy-Nagy, ed. Krisztina Passuth, New York: Thames and Hudson, 1985. "Photography Unparalleled", trans. David Britt, in From Between Two Worlds: A Sourcebook of Central European Avant-Gardes, 1910-1930, The MIT Press, 2002. "Contribution to the Debate on the Article 'Painting and Photography by Erno Kallai'", in Moholy-Nagy, ed. Krisztina Passuth, New York: Thames and Hudson, 1985. "Photography is Creation with Light", in Moholy-Nagy, ed. Krisztina Passuth, New York: Thames and Hudson, 1985. "Photography is Manipulation of Light", in Moholy-Nagy, ed. Andreas Haus, New York: Pantheon, 1978. "Sharp or Fuzzy? ", in Moholy-Nagy, ed. Krisztina Passuth, New York: Thames and Hudson, 1985. "Photogram and Frontier Zones", in Moholy-Nagy, ed. Krisztina Passuth, New York: Thames and Hudson, 1985. "The Future of the Photographic Process", Transition 15 (February 1929), pp 289-293. "In Answer to Your Interview", The Little Review 12:2 (May 1929): 54-56. Repr. in Moholy-Nagy, ed. Richard Kostelanetz, New York: Praeger, 1970. "Light-Space Modulator for an Electric Stage", in Moholy-Nagy, ed. Krisztina Passuth, New York: Thames and Hudson, 1985. "Light Requisite for an Electric Stage", in Beyond Art, ed. Peter Weibel, Springer, 2005, p 81. 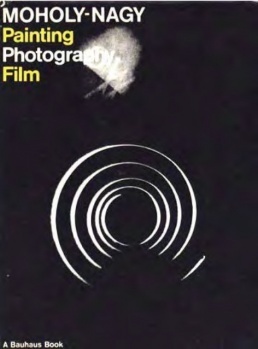 "Light Display Film", in Moholy-Nagy, ed. Krisztina Passuth, New York: Thames and Hudson, 1985. "New Film Potentialities", in Moholy-Nagy, ed. Krisztina Passuth, New York: Thames and Hudson, 1985. "Painting and Photography", in Moholy-Nagy, ed. Krisztina Passuth, New York: Thames and Hudson, 1985. "New Film Experiments", in Moholy-Nagy, ed. Krisztina Passuth, New York: Thames and Hudson, 1985. "An Open Letter to the Film Industry", Sight and Sound 3:10 (1934), pp 56-57. Repr. in Moholy-Nagy, ed. Krisztina Passuth, New York: Thames and Hudson, 1985. "Letter to Kalivoda", Telehor 1-2 (February 1936), Brno, pp 30-32. "From Pigment to Light", Telehor 1-2 (February 1936), Brno, pp 32-34; repr. in Photography in Print and Writings from 1916 to the Present, ed. Vicki Goldberg, Albuquerque: University of New Mexico Press, 1981, pp 339-348. "A New Instrument of Vision", Telehor 1-2 (February 1936), Brno, pp 34-36. "Problems of the Modern Film", Telehor 1-2 (February 1936), Brno, pp 37-40. "Supplementary Remarks on the Sound and Colour Film", Telehor 1-2 (February 1936), Brno, pp 41-42. "Once a Chicken, Always a Chicken", Telehor 1-2 (February 1936), Brno, pp 43-45. "Light Architecture", Industrial Arts 1:1 (Spring 1936), pp 15-17. Repr. in Moholy-Nagy, ed. Richard Kostelanetz, New York: Praeger, 1970. "Photography in a Flash", Industrial Arts 1:4 (Winter 1936), London, pp 294-303. Repr. in Moholy-Nagy, ed. Richard Kostelanetz, New York: Praeger, 1970. "Subject without Art", The Studio 12 (November 1936), p 259. Repr. in Moholy-Nagy, ed. Richard Kostelanetz, New York: Praeger, 1970. "Modern Art and Architecture", Journal of the Royal Institute of British Architects 44:4 (January 1937). Repr. in Moholy-Nagy, ed. Krisztina Passuth, New York: Thames and Hudson, 1985. "Light Painting", in Circle: International Survey of Constructive Art, eds. J. L. Martin, Ben Nicholson, and Naum Gabo, London: Faber and Faber, 1937. "Moholy-Nagy, Picture Hunter, Looks at the Paris Exposition", Architectural Record 82 (October 1937), p 92. "The New Bauhaus and Space Relationships", American Architect and Architecture 151 (December 1937), pp 23-28. Repr. in Moholy-Nagy, ed. Richard Kostelanetz, New York: Praeger, 1970. "Paths to the Unleashed Color Camera", Penrose Annual 39 (1937), pp 25-28. Repr. in Moholy-Nagy, ed. Richard Kostelanetz, New York: Praeger, 1970. "Education and the Bauhaus", Focus 2 (Winter 1938), pp 20-27. Repr. in Moholy-Nagy, ed. Krisztina Passuth, New York: Thames and Hudson, 1985. "From Wine Jugs to Lighting Fixtures", in Bauhaus 1919-1928, eds. Herbert Bayer, Walter Gropius, and Ise Gropius, New York: Museum of Modern Art, 1938, pp 136-141. "Why Bauhaus Education", Shelter 1 (March 1938), pp 8-21. "Light-A New Medium of Expression", Architectural Forum 70 (May 1939), pp 388-392. Repr. in Moholy-Nagy, ed. Richard Kostelanetz, New York: Praeger, 1970. "Painting with Light-A New Medium of Plastic Expression", Penrose Annual 41 (1939), pp 25-31. "Make a Light Modulator", Minicam Photography 3:7 (March 1940). Repr. in Moholy-Nagy, ed. Richard Kostelanetz, New York: Praeger, 1970. "Better than Before", Technology Review 46:1 (November 1943), pp 45-48. "Space-time and the Photographer", American Annual of Photography 57:52 (1943). Repr. in Moholy-Nagy, ed. Krisztina Passuth, New York: Thames and Hudson, 1985. "Surrealism and the Photographer", The Complete Photographer 9:52 (1943), pp 3337-3342. "The Contribution of the Arts to Social Reconstruction", 1943/1970. "Design Potentialities", in New Architecture and City Planning, ed. Paul Zucker, New York: Philosophical Library, 1944, pp 675-87. Repr. in Moholy-Nagy, ed. Krisztina Passuth, New York: Thames and Hudson, 1985. "Photography in the Study of Design", American Annual of Photography 59 (1944), pp 158-164. "In Defense of Abstract Art", Journal of Aesthetics and Art Criticism 4:4 (1945), pp 74-76. Repr. in Moholy-Nagy, ed. Richard Kostelanetz, New York: Praeger, 1970. "On Art and the Photograph", Technology Review 47:8 (June 1945), pp 491-494. "New Education - Organic Approach", Art and Industry 40 (March 1946), pp 66-77. "Art in Industry", Arts and Architecture 64:1 (September 1947), p 30, and (October 1947), pp 28-33. Repr. in Moholy-Nagy, ed. Krisztina Passuth, New York: Thames and Hudson, 1985. László Moholy-Nagy: From Budapest to Berlin 1914-1923, ed. Belena S. Chapp, University of Delaware, 1995. 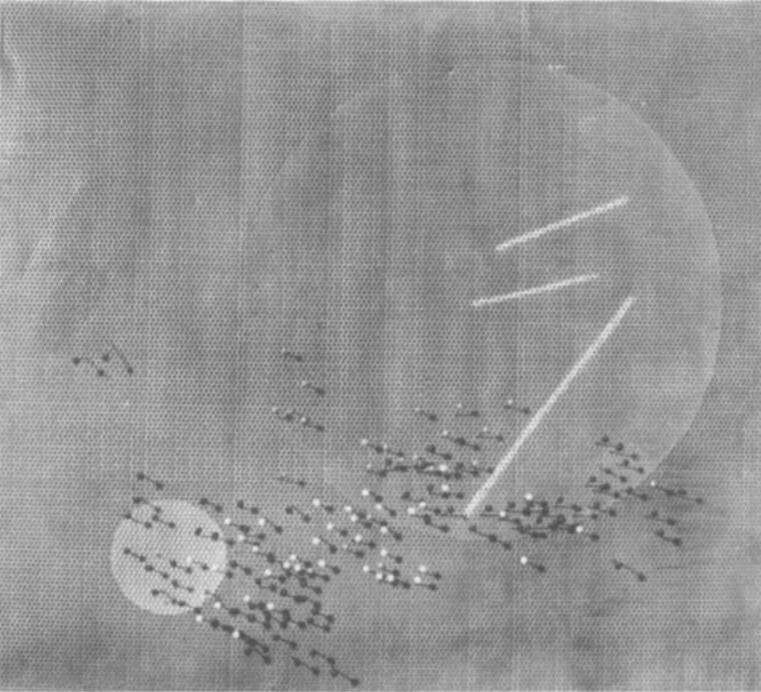 Oliver A. I. Botar, Technical Detours: The Early Moholy-Nagy Reconsidered, New York: Art Gallery of the CUNY Graduate Center, 2006. 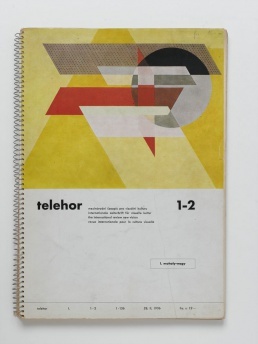 Telehor 1-2: Special Issue on L. Moholy-Nagy, 1936. Log. 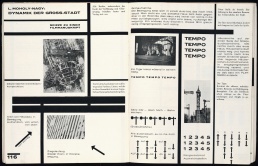 Dianne Kirkpatrick, "Time and Space in the Work of László Moholy-Nagy", pp 63-76. Hungarian Studies Review 37(1-2): "Proceedings of the symposium László Moholy-Nagy: Translating Utopia Into Action", eds. Oliver A.I. Botar and Hattula Moholy-Nagy, Spring-Fall 2010. Richard Kostelanetz, "Moholy-Nagy: The Risk and Necessity of Artistic Adventurism", 1969. Louis Kaplan, "The Telephone Paintings: Hanging up Moholy", Leonardo 26:2, 1993, pp 165-168. Catherine David, "Vision, Motion, Emotion: Moholy-Nagy's Experimental Activity", in Beyond Art, ed. Peter Weibel, 2005, pp 78-80. Noam M. Elcott, "Rooms of Our Time: László Moholy-Nagy and the Stillbirth of Multi-Media Museums", in Screen/Space, ed. Tamara Trodd, Manchester University Press, 2011, pp 25-52. Oliver I.A. 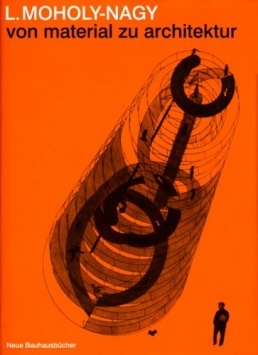 Botar, Prolegomena to the Study of Biomorphic Modernism: Biocentrism, László Moholy-Nagy’s “New Vision” and Ernő Kállai’s Bioromantik, University of Toronto, 1998, 762 pp. Ph.D. Dissertation. Albers and Moholy-Nagy: from the Bauhaus to the New World exhibition, Tate Modern, London, 2006. Teacher's pack (PDF). This page was last modified on 26 January 2019, at 12:54. This page has been accessed 192,865 times.